Our approach must be transnational and leverage both the public and private sectors. Everyone deserves access to affordable and quality care. In South-East Asia, this issue is made more complex by our vastly different health challenges and systems to address them. In this region, we must tackle everything from eliminating dengue in rural areas to the surging rates of diabetes among the rising middle class. And we must do all this while acknowledging the distinct healthcare regulations and practices found in each country. South-East Asia boasts some of the world’s most progressive healthcare models, alongside others that struggle to meet local needs. Despite this diversity, one clear commonality exists: patients are demanding more accessible and affordable healthcare and governments are working to provide it. As we stand on the precipice of rapidly evolving healthcare landscapes, with ageing populations and rising rates of chronic disease, now is the perfect time to introduce innovative solutions that will disrupt the health market. It is a well-established fact that demographic shifts loom for Asia. Experts project Asia's over-60 population will swell to nearly 1.3 billion by 2050 – an increase of 12.7% compared with 2016. Ageing populations face a higher risk of chronic diseases and require more regular monitoring, yet healthcare systems are not positioned to absorb this burden, particularly on increasingly lean resources. Instead, we must rely on patients to take greater ownership of their own healthcare in order to relieve impending capacity constraints on national systems. The good news is that patients today are more educated and empowered to act on their health than ever, with 70% of people confident in managing their own healthcare information and decisions. Digital technology is furthering access to information and care and improving overall health literacy. More than 86% of patients do a health-related internet search before they decide to visit a doctor, and 60% of patients search their prescription to better understand the usage, benefits and risk before taking the medication. The reality is that patients do not exist within a single border. Extensive tourism, travel and migration flourish between the countries of this region. South-East Asian leaders should pursue unified regulations that seek to better guarantee patient privacy and data protection, while providing quality healthcare. Eliminating legal roadblocks will allow patients to take greater ownership of their health, reducing the burden on national systems. 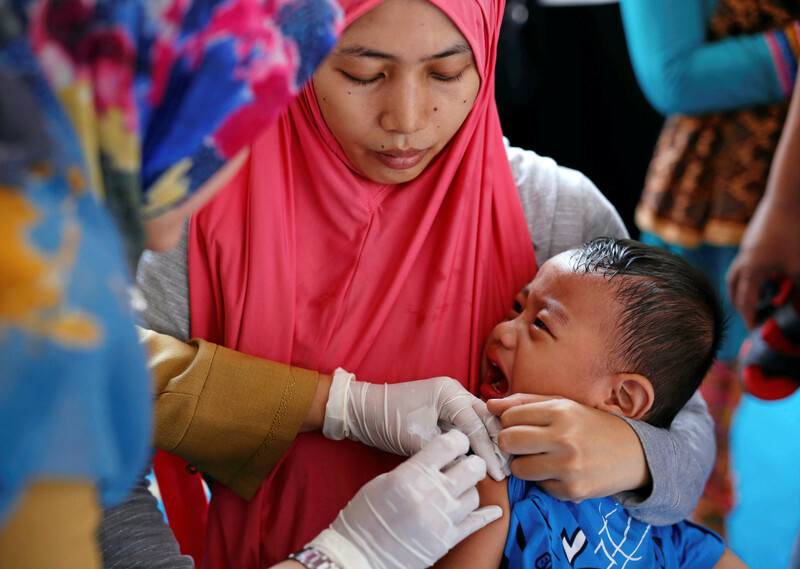 A child is vaccinated in Jakarta, Indonesia. Good healthcare cannot exist in silos. The only way to truly tackle healthcare challenges is through strategic and coordinated efforts by the right players. This is true whether trying to eradicate infectious disease, better manage noncommunicable disease (NCD) or simply engender healthy lifestyle behaviours across South-East Asia. As we work to navigate new healthcare challenges, our approach must be transnational and leverage the best of both the public and private sectors. We can already see the critical impact of cross-sector partnerships in action. For example, in Singapore, suppliers and corporations work side-by-side with the government to tackle obesity, partnering to make healthier foods more affordable and widely available, in lockstep with consumer education campaigns on healthy eating habits. This joint bid aims to halt the rise of NCDs, using the best of both private-public assets and institutional knowledge. Similarly, in the fight to eliminate tuberculosis (TB), the Fullerton Health Foundation recently partnered with both the Global Fund to Fight AIDS, Tuberculosis and Malaria and Indonesia’s Ministry of Health to host mobile diagnostic clinics in South Sulawesi. We tested more than 2,000 patients for TB with the aim of reaching vulnerable patients with limited access to the traditional healthcare system. The combined insights of all partners ensured targeted outreach to the right people, as well as a strong mechanism to translate a positive diagnosis into treatment and disease management. Partnerships are necessary, but they must be smart. They should leverage strengths and streamline efforts to ensure maximum impact with thoughtful, intentional use of limited collateral and resources. Patient-centricity is also key, allowing organizations to come together to ensure high-quality, accessible and affordable healthcare. Not surprisingly, technology will play a critical role in the future of South-East Asia’s healthcare systems. Today, apps remind us to get vaccinated, take medicine and attend appointments. Telemedicine allows people to make appointments virtually, with convenience increasing the probability individuals will take proactive steps to manage their health. Other technology-enabled initiatives also seek to improve health outcomes. Fullerton Health’s recently launched Remote Health Monitoring Programme in Singapore equipped chronic disease patients with devices that allow them to transmit their health measurements to nurses and doctors automatically, as well as remind them when a reading is missed. The early detection of health deterioration enables prompt medical care and prevents the condition from worsening, reducing long-term healthcare costs. Patients are also more likely to adopt healthy lifestyle habits as a result of a better understanding of their health. At a macro level, mobile technology is allowing countries to overcome infrastructural and regulatory constraints and provide increased access to care. For example, Viet Nam’s national Expanded Programme on Immunisation (EPI) and global health NGO PATH piloted a digital immunization registry, ImmReg, in 2012. Following the pilot, they concluded that digital immunization registries that incorporate SMS reminders can improve vaccine uptake and adherence to recommended vaccine schedules. Similar digital approaches can be used to verify the quality of prescription medicines, manage supply of vaccines and medicines and digitize medical records. Digital disruption allows us to connect directly with patients in ways we could not in the past. As a result, healthtech has the potential to unlock solutions to many of the looming demographic challenges facing South-East Asia, cutting through the clutter to allow healthcare professionals to interface with patients directly. Regional diversity does not preclude South-East Asia from pursuing regional solutions. Together, we must reduce complexity and realign around the foremost goal of improving the health of patients. We can do that only by empowering patients, fostering collaboration and leveraging the most effective tools at our disposal. Because South-East Asia has less established and entrenched healthcare systems, we are well positioned to leapfrog into the next phase of healthcare, towards a healthier future.